From the fifteenth to the eighteenth centuries, the major cultures of southern India underwent a revolution in sensibility reminiscent of what had occurred in Renaissance Italy. During this time, the imagination came to be recognized as the defining feature of human beings. More than Real draws our attention to a period in Indian history that signified major civilizational change and the emergence of a new, proto-modern vision. In general, India conceived of the imagination as a causative agent: things we perceive are real because we imagine them. David Shulman illuminates this distinctiveness and shows how it differed radically from Western notions of reality and models of the mind. Shulman's explication offers insightful points of comparison with ancient Greek, medieval Islamic, and early modern European theories of mind, and returns Indology to its rightful position of intellectual relevance in the humanities. 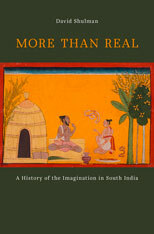 At a time when contemporary ideologies and language wars threaten to segregate the study of pre-modern India into linguistic silos, Shulman demonstrates through his virtuoso readings of important literary works—works translated lyrically by the author from Sanskrit, Tamil, Telugu, and Malayalam—that Sanskrit and the classical languages of southern India have been intimately interwoven for centuries.